Blogging had changed my perception of food!!! I remember myself as a picky eater and the traits are inherited by my kids too. But the blogging world had extended the horizon for me to a vast spectrum of food that I would have never tried years ago. It impacted the eating habits of my whole family. I still remember to this day, the first expression of my kids when I served the Roasted Brussels Sprouts to my kids. The very look on my daughter's face after taking the first bite was hilarious. But now they absolutely love them. Other vegetables and grains I may not have tried before are stocked in my refrigerator & pantry now. Being a person who never liked to even try something new has transformed into someone who would at least give it a shot is the big change I noticed in myself since blogging. Appreciating different cuisines; experimenting them in my kitchen; enjoying them with my family are the perks of blogging. I might have crossed the legumes and grains aisle so many times in Indian store without paying attention to these yellow peas, as peas was never my favorite. My elder son also tries to avoid it if possible, which he inherited from me :). It was a month ago I started using these yellow peas and realized what I was missing. To my surprise, the whole family devoured each and every bit of the peas curry with Roti when I made it for the first time. That gave me the courage to pair it with healthy green kale and it was an instant winner. 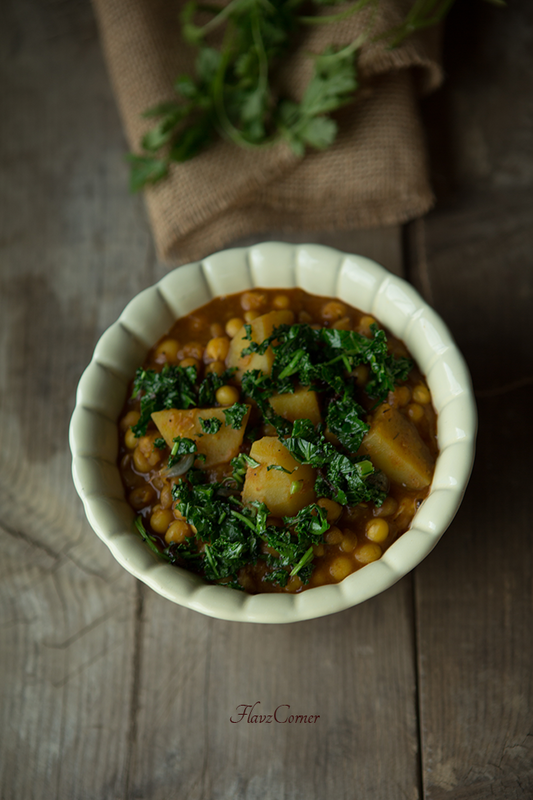 The yellowish peas stewed in masala with cubes of potatoes and dressed with green kale gives this curry an appeasing look that even a picky eater cannot resist. When fresh peas are not available, it is always good to have a pack of dried peas in your pantry to enjoy it. 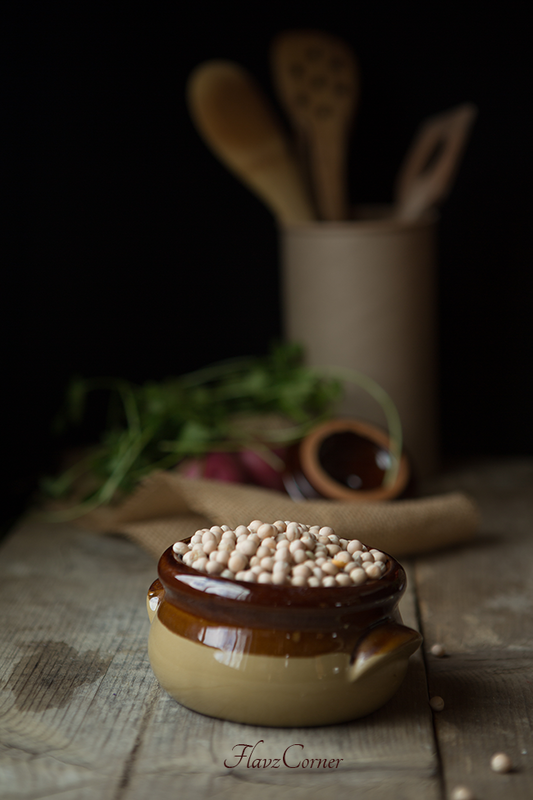 Are you interested in knowing more about dried peas? Dried peas are a good source of cholesterol lowering fiber and helps to maintain healthy levels of blood sugar. They are good source of heart healthy nutrient like Potassium that can reduce high blood pressure. Dried peas provide energy to burn with its high fiber content. Dried peas is an excellent source of mineral called molybdenum that can detoxify sulfites. Sulfites are preservatives used in foods that can cause increased heart beat, headache and even disorientation to people who are sensitive to it. A cup of cooked peas can help you if you are sensitive to sulfites. Soak 1 1/2 cup dry yellow peas in water for 8 hrs or over night. Drain the water and wash twice. Place the soaked peas in a pressure cooker with 4 cups of water and 1/2 tsp of salt. Cook till 4 whistle blows. Turn off the burner and let it cool. While the peas is getting cooked, you could make the tadka. Take a cast iron pan or non stick pan and splutter 1/4 tsp of mustard seeds in 1 1/2 tsp oil. Add the sliced shallots and cook till light golden brown. Now add the chopped Kale and mix well. Season with salt and cook for 1 minute. Turn off the burner and add the chopped Cilantro leaves. Transfer the Tadka to another bowl and set aside. Clean the pan with a paper towel. In the same cast iron pan, add 1 tsp of oil and 1 cup of chopped onions. Add a pinch of salt and saute till the onions are light brown color. Remove the onions and let it cool. Add 1 to 2 tbsp of water and make a paste out of this caramelized onion in a food processor or blender. Add 1 tbsp of oil to the same pan and add the caramelized onion paste and ginger garlic paste. Cook till the raw smell of garlic is gone. Add turmeric powder, chili powder, garam masala, Chhole masala. Cook for a minute. Now add the chopped tomato and cook till it is mushy. Add the cubed potatoes and stir for another minute. Adjust the salt. Turn off the burner. Transfer the prepared masala from the above step to the pressure cooker with cooked peas. Add 1/2 cup of water to the pressure cooker. Close the lid and cook till 2 whistle comes. Turn off the burner and let the pressure subside completely. Open the pressure cooker and add the dry fenugreek leaves by rubbing them between your hands. Add the prepared Kale tadka to the curried peas, give a stir. Enjoy it with vegetable pulao or Indian flat breads like Roti, Naan or Chapathi. Make the caramelized onion paste ahead and freeze - I always make a batch of caramelized onion paste with 3 or 4 big onions and freeze them. The best way to store them is by first freezing them in a glass container like a rectangular pyrex container. Once the onions are set, take the container out and let it sit in room temperature for 5 minutes. Now using a serrated knife, cut the frozen paste into cubes. Transfer the cubes in a zip lock bag or any freezer safe container. So when you want to make any curry that needs a thick gravy, just take 2 or 3 cubes and throw it along with ginger garlic paste. This makes my life easier on weekdays to cook something Indian. 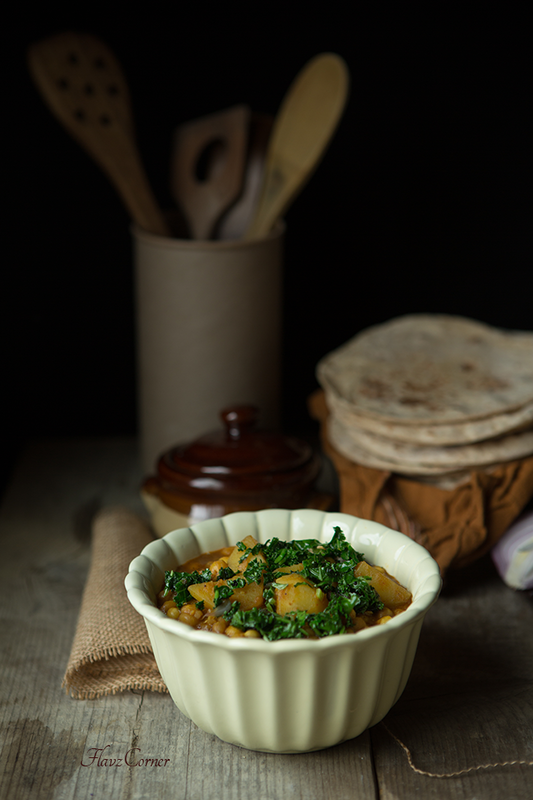 When the peas is getting cook, make the Tadka with kale and the masala for the curry. This will cut down the cooking time and helps to prepare the curry within 30 minutes. Kashmiri chilli gives the bright color without the heat. You can substitute it with Paprika powder if you don't have Kashmiri Chilli powder. Make sure you cook the Paprika along with other masala powder to remove the raw smell. You can use spinach instead of Kale. You can get the Chhole masala powder from Indian stores. The dry fenugreek powder gives a unique north Indian flavor to this dish. I like the gravy of this curry to be thick instead of runny. So I used less amount of water. Feel free to increase the volume of the water if you don't prefer a thick gravy. Don't skip the step of adding caramelized onion paste to this curry. Trust me, it adds a nice flavor to this dish. Great curry for lent. And gorgeous moody pics! Looks so delicious dear :) Very happy to follow you dear..Will be happy if u follow me back !! The curry sounds delicious and I am loving the moody clicks. 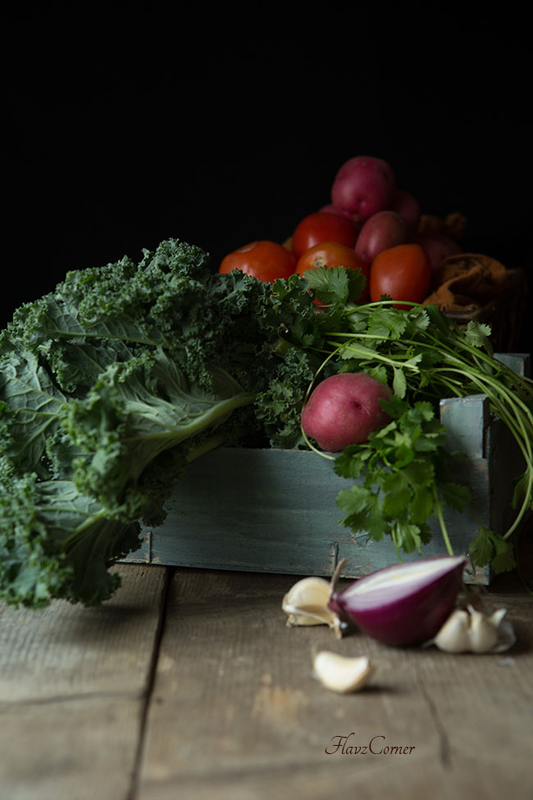 Blogging does bring changes in our outlook towards food and certain ingredients. I eat legumes every day...love this combination of with potatoes. I was thinking today to make something with curry-)) I have a butternut squash so I think it would be a perfect. We still have a cold weather here so this dish would be perfect to warm us a little-)) Thank you for the inspiration! I love most dried pulses and legumes! So this dish is perfect for me. I don't often use yellow peas for some reason, although I do from time to time (and have some on hand right now -- how convenient!). Terrific recipe -- thanks.